One of the things our Traveller group at ShinnCon decided was that we wanted to eventually get into large scale, epic fleet battles. Classic Traveller (and related systems like Striker, Mayday, Azhanti High Lightning which deal with skirmish, on-ship or small ship-to-ship encounters) doesn’t seem to be well suited to this. Especially given we have 9 players! So I’ve been researching starship miniatures combat systems. Players can learn system in < 20 minutes — Given we have 9 players, and not everyone will take time to read rules off-line, we need it to be a quick-to-learn system. Can scale to 20+ ships per side — Probably we’ll give each player 3-4 ships or something, and have some players play the part of the bad guy ships. 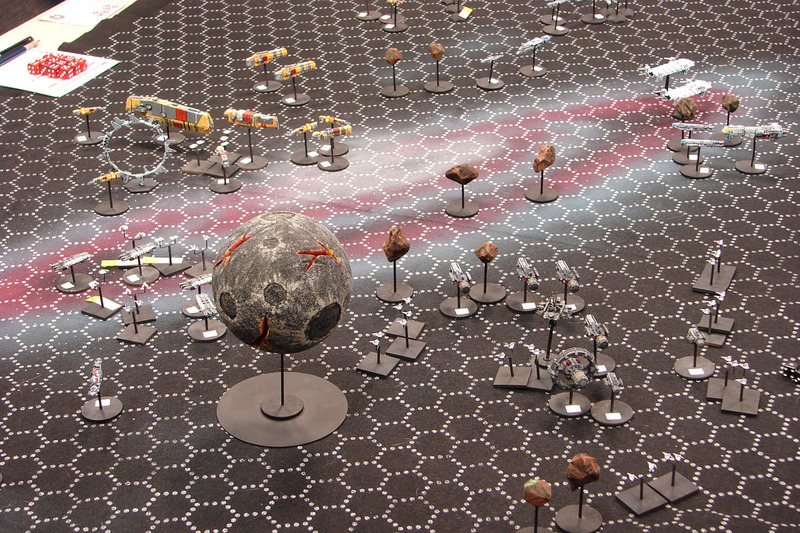 With 9 players that could be 25-40 ships on the battlemat. Fast and furious — I want us to play and wrap up in < 4 hours, so we can get some roleplaying in as well. Adapts to multiple universes — I want to replay fleet combats in multiple settings (Traveller, Star Frontiers, Star Wars, etc.) and it would be nice if we could use the same rules for multiple settings. Traveller compatibility — Would be cool if we used 2d6, and in general, if someone has done the homework to do a Traveller conversion. Seem like nice rules. Not sure how well they convert to other settings, or scale to multiple players. Will definitely consider these though, as we’ll eventually be doing a Star Frontiers game after our Traveller run. Right now if I had to guess, this is the front-runner. Players: 2-6 Players (but, I bet we can push the envelope on this). Play Time: “We have played even with kids as young as 12 who have never played Starmada with 50+ ships per side in 3-4 hours. Done it several times. Even our small games run 15-25 ships per side. Those run 2-3 hours. Great support and lots resources. It does seem to be a bit crunchier than the systems above though. Full Thrust. Rules are free, there’s easily a hundred or more ships made by the manufacturer that work with most ‘standard’ scale ships (smaller than Firestorm Armada, larger than B5 Fleet Action – though those work, too). The rules work with, well, any background you want, just change the names of the weapons to suit your fiction. Cinematic or ‘vector’ movement, easy construction, only uses ‘normal’ dice. A friendly, helpful mailing list. If you want small to medium sized fleets (a dozen vessels per side or less), that’s where most games these days tend to sit. Full Thrust, Starmada, etc. If you want larger fleets (about 20 or so per side, possibly up to 30), then A Sky Full of Ships seems to be a popular choice.